White nationalist Matthew Heimbach is planning a college speaking tour starting at the University of Tennessee in Knoxville amid some turmoil within the Traditional Worker Party (TWP) and questions from the outside. The “National Socialism or Death” tour is scheduled to kick off on Saturday, February 17, but in a blog post Heimbach hints at more stops after Knoxville. “We will not give a single inch to the enemy, and we will keep confronting them until we’ve seized what belongs to us: control over our destiny from this globalist imperial regime,” Heimbach wrote on the TWP website. The speech, though, comes during a tough time for TWP. Leaders have been bickering with other figures in the white nationalist movement and whose own tenets of “faith, family and folk” have come into question with the disclosure of some of the sexual inclinations of its members — as detailed earlier last week in a report by the Southern Poverty Law Center. While the planned speech and TWP have created a buzz on the racist message board Stormfront and the alt-right social media site Gab, not all the chatter has been good. A very public divide has surfaced on Gab between people pumping up the speech and those attacking Heimbach and TWP over a Yahoo News article questioning both Heimbach and the organization. While the speech has drawn calls to attend, the Yahoo story is undercutting the message of unity some on the white nationalist movement and alt-right have pushed. A Gab user going by chan chan studios (@PropagandistHacker) applauded Heimbach and his lieutenant Matthew Parrott on Saturday. “luv me sum parrott & heimbach,” chan chan studios wrote. Others, though, appeared dismayed by the Yahoo News story. “Heimbach and the tard worker party are done here,” wrote a Gab poster using the name screen name “John J. Johnson” (@ChickenNuggetScoon), who linked to the Yahoo News story. And, the group may have used some misdirection in order to land a spot at the university. University officials told The Knoxville News-Sentinel the Traditional Worker Party misrepresented itself as a church when requesting space on campus for the event. Vice Chancellor of Communications Ryan Robinson told the paper that someone called the university to reserve space at McClung Museum of Natural History and Culture, but later called back to change the name of the person making the reservation. The second call, Robinson said, put the event in the name of a person with ties to a racial separatist group. Robinson said the school has since learned the church had no affiliation with the request or the event. University officials did not immediately return messages from the Southern Poverty Law Center seeking comment on Monday. TWP’s Tennessee chapter has denied misleading anyone. 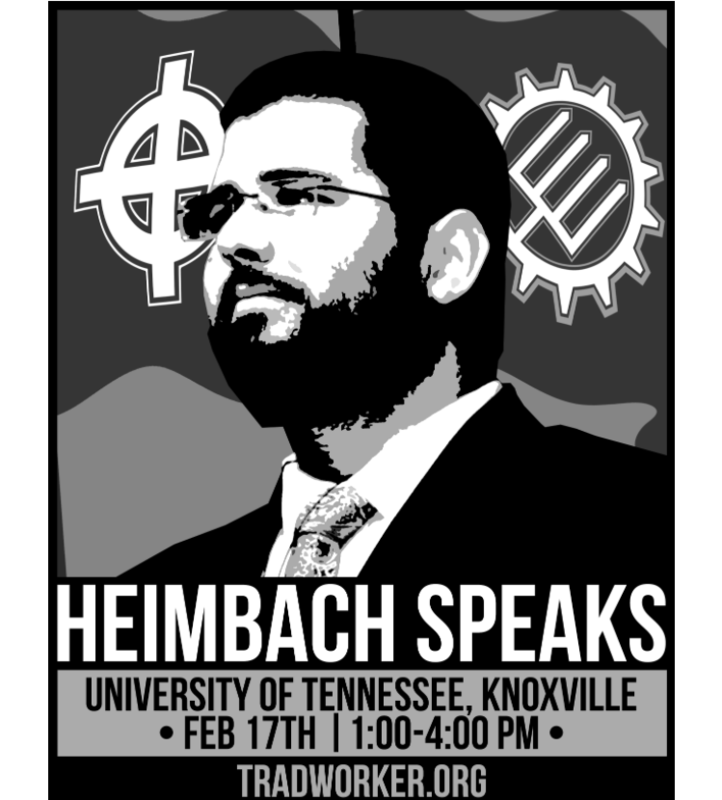 Heimbach’s plans for a university tour mark the latest attempt by white supremacists and white nationalists to bring their message to the halls of higher education. Racist alt-right front man Richard Spencer has held several ill-received speaking engagements on college campuses. And, his booker, Cameron Padgett, continues to try to schedule Spencer at universities around the country, filing lawsuits when he can’t get the day or place he wants. From time to time, violence has erupted outside Spencer’s speaking engagements, including at the University of Florida, where three people were charged with attempted murder after shots were fired after the speech. And, this isn’t the first foray onto the University of Tennessee campus for TWP. The group, in December, tagged The Rock on campus with neo-Nazi and white supremacist slogans, in one case painting over a sign welcoming new football coach Jeremy Pruitt to campus and in another marring a birthday message to a student. The Rock is just that – large boulder on campus students use as a message board to reflect what is happening on campus and send greetings to each other. The Knoxville speech is the latest foray into East Tennessee for TWP. The group tried to co-opt an anti-abortion march organized by Tennessee Right to Life in January.